SFS operates permanent field stations, located in areas especially suited for academic study and community engagement, to provide a context for students seeking to understand complex environmental issues on a global scale. SFS centers are fixtures in communities; home to faculty, staff, and students; and anchor the long-term research upon which our mission is based. Students have the opportunity to engage in meaningful community outreach that strengthens both SFS' ties to the community and the student’s own sense of place and belonging while abroad. In addition to regular coursework, students participate in outreach activities such as tree plantings, stream clean ups, and youth swim classes, and present research findings to interested stakeholders and members of the community at the end of the term. These opportunities create meaningful connections between coursework and the surrounding environment, and enable students to contribute to host communities. Students in Australia live with host families for a weekend, and in Cambodia they stay with a family in a floating village for a night, while other programs offer daystays, all of which deepen students’ understanding of local cultures and ways of life. On their own time, students are encouraged to attend cultural events, travel to and explore nearby towns, try local cuisines, and develop community ties outside of SFS. Many of our centers are well-known in their host communities and these opportunities can enhance the student’s sense of belonging beyond that of a conventional tourist. Environmental issues are complex. To effectively address these issues, our faculty must possess multidisciplinary knowledge and skills, and teach courses that expand in scope beyond traditional subjects. The SFS curriculum encourages students to observe, discuss, question, reflect, and experience the implications of the issues around them. In addition to natural and environmental science courses, all SFS programs include a social science course, tackling topics such as environmental ethics and justice, policy, and economics. Classroom lectures and field excursions incorporate multiple perspectives and emphasize indigenous voices. Woven throughout all SFS courses are themes of anthropogenic environmental change and the sociocultural context behind current issues. This challenges students to consider their own roles in environmental change and encourages more personal discussions about individual action. The experiential nature of our programs balances coursework with field work, allowing students to actively engage with the ecosystems they study and gain a deeper understanding of regional and global environmental issues. Students take part in hands-on field exercises in each of the disciplinary courses to reinforce the academic material presented. These exercises also help students practice field techniques, data analysis, and gain other practical skills. Research plans at each center enable students to contribute to research that is long-term, impactful, and meaningful to their host communities. Intercultural Leadership Workshop Series: Developed by the SAM in Costa Rica, this series challenges students to engage in topics of personal identity, host family day/cross-cultural adaptation, power and privilege, microaggressions, and leadership styles. These activities create inclusive spaces for open dialog and reflection. Appreciation mailbox and shout-outs: In Panama, students developed a system in which they leave each other notes of affirmation. This is coupled with daily morning shout-outs during which students publicly recognize their peers for doing positive things. These are informal but powerful ways in which SFS students show their support and care for one another while on program. We recognize that solving today’s greatest environmental challenges requires that all people have a seat at the table, and SFS strives to cultivate inclusive communities; encouraging student cohorts that represent human diversity across the globe. We believe diversity in all forms fosters greater open-mindedness, expands learning opportunities, and contributes to a positive environment in which to live and learn. To read our statement on diversity and inclusion, click here. SFS programs exist to address environmental issues. Our research agenda emphasizes the interests of local stakeholders and directly addresses regional environmental issues. 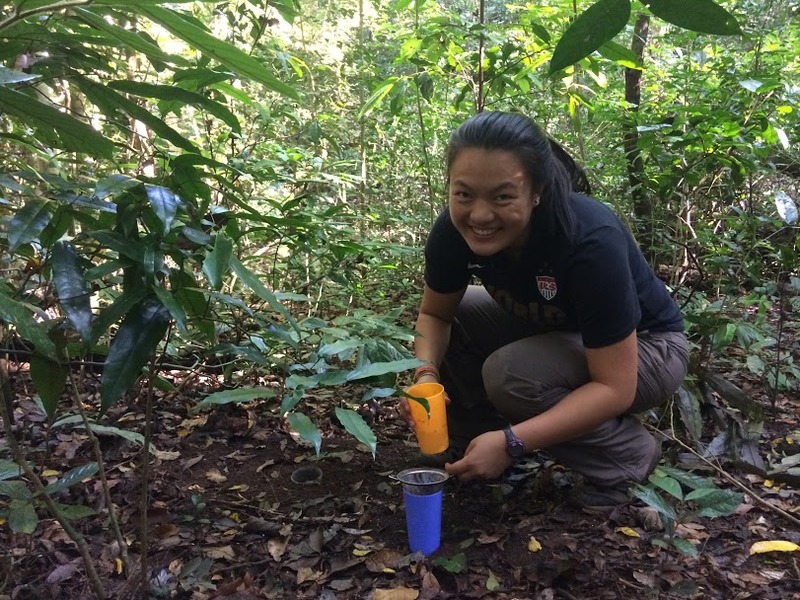 SFS students are passionate about and committed to the environment, and are often drawn to SFS because of our research and environmental focus. Many students bond over similar academic interests, career-related goals, and core values, and can feel supported and appreciated by their peers as they explore their passions. Although students come from very different backgrounds, they are brought together on SFS programs by a strong desire to learn about the environment and contribute to its protection. Students may enter the program feeling like an outsider in a foreign place, but leave as part of the global SFS family, having formed lifelong friendships and lasting connections to their host community. Students take with them a deeper understanding of environmental issues and the ability to critically analyze their own biases and assumptions about the world. Each cohort leaves behind meaningful research for future students to build upon, contributing to the SFS legacy of scientific knowledge and impactful change. The SFS model is intentionally designed to give students a well-rounded education, grounded in research and real-world application. Our centers are long-term fixtures in the countries where we operate, allowing for meaningful relationships within our communities and opportunities to study diverse ecosystems over long periods of time. Our curriculum is interdisciplinary, reflecting the complex nature of the environmental issues we study. Significant time spent in the field gives students the chance to experience firsthand the topics they’re studying and develop practical skills in the natural and social sciences. Our model is also designed to provide a supportive environment for students to learn, explore, and grow. Students from diverse backgrounds live, work, and study as a group – brought together on SFS programs by their shared desire to learn about the environment and explore their role in protecting it. Students leave behind meaningful research, and take with them practical skills and lasting friendships. Through our programs they become empowered, validated, and inspired to join the next generation of environmental leaders. SFS operates permanent field stations, located in areas especially suited for academic study and community engagement, to provide a context for students seeking to understand complex environmental issues on a global scale. SFS centers are fixtures in communities; home to faculty, staff, and students; and anchor the long-term research upon which our mission is based. Students have the opportunity to engage in meaningful community outreach that strengthens both SFS’ ties to the community and the student’s own sense of place and belonging while abroad.